• Reacciones adversas al alimento en perros con dermatisis atópica. • Problemas intestinales con prurito asociado. • Otitis externa de componente alérgico. • Regenearción de la barrera lipídica de la piel. Maíz, trucha, arroz, harina de gluten de maíz, harina de trucha, grasa animal, proteína de patata, pulpa de remolacha, colágeno hidrolizado, levadura, proteínas animales hidrolizadas, aceite de soja, aceite de pescado, fibrea vegetal, fosfato monocálcico, carbonato de calcio, cloruro de potasio, sal, hoja de olivo, aloe vera. Advance, an investment in your pet’s health. The foundation for good health is a strong immune system, and a good diet is fundamental to achieve this. You control 100% of their diet. 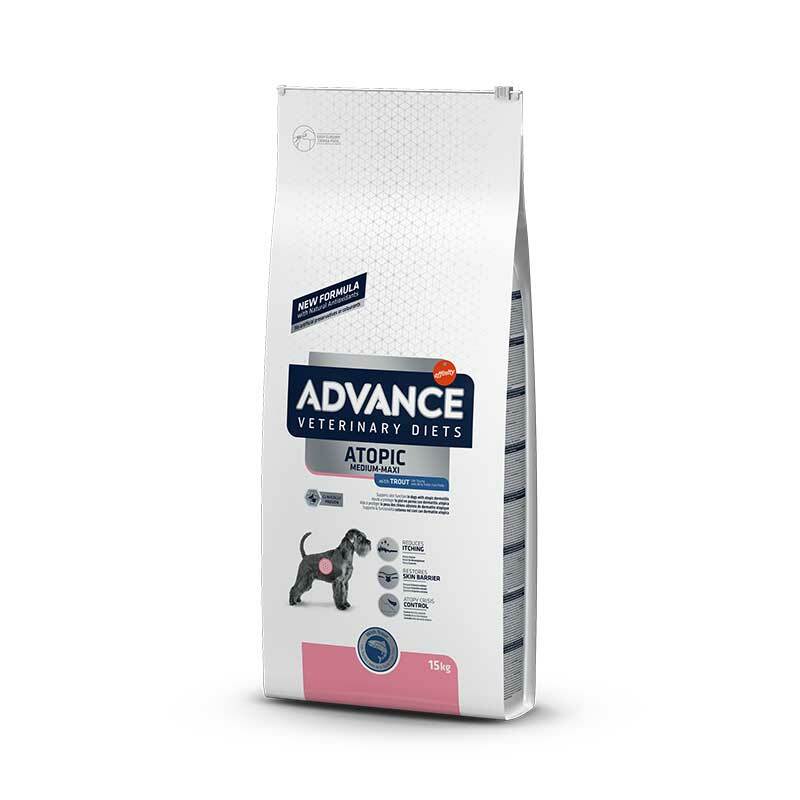 ADVANCE is the only pet food reinforced with active antibodies (active immunoglobulins) that help protect your dog’s and/or cat’s intestines, ensuring that they are better protected against foreign bodies. The ADVANCE formula is packed full of vitamins, minerals, natural antioxidants (natural polyphenols) to maintain your pet’s optimal health through nutrition. ADVANCE products contain animal-based ingredients with high quality proteins, such as chicken, turkey, salmon or lamb together with easily digestible cereals such as rice, wheat and corn. All this gives ADVANCE products a superior flavour. ADVANCE’s constant innovations in advanced natural solutions lead vets to recommend the brand.